bl.uk > Online Gallery Home	> Online exhibitions	> Asia, Pacific and Africa Collections	> Escape-river Dam, Madhopoor. 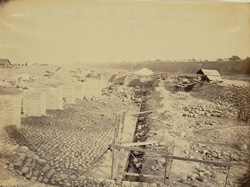 Photograph from the Crofton Collection: 'Public works including the Manora Breakwater and the River Son canal system', taken in 1869. A caption on the reverse of the print reads, 'New head works, Baree Doab Canal, 1869'. The Bari Doab Canal is a perennial irrigation canal branching off from the Ravi river and supplying the districts of Guradspur, Amritsar and Lahore in the Bari Doab or the area between the Beas and Ravi. The weir and regulating head-works at the village of Madhopur in Gurdaspur District were completed in 1875.